1. A trained photographer takes 100 high-quality, memorable listing photos using a DSLR camera. 92% of house-hunters search the internet for homes, and 60% of buyers select the homes they will view by the pictures they see on the internet. Many agents take crooked pictures with bad lighting and dubious framing on a phone because they forgot their camera. Our photographer uses a top-end Nikon digital camera with wide angle and other lenses, tripod for natural lighting, professional flash for darker rooms, and the “magic hour” for exterior pictures so they really pop. Homes advertised with DSLR (digital single-lens reflex camera) images are more likely to sell quickly for top dollar than are those marketed with common point-and-shoot photos. 2. We create a custom website for your home using your address, such as www.123MyHomeStreetAddress.com. On this website we can post an unlimited number of pictures, a virtual tour, and video. Then you, everyone you know, everyone we know and all of our real estate partners have a powerful link we can email, share on Facebook and social media and 360+ real estate related websites. 3. We work with you to share your website over Facebook, social networking and email. 4. 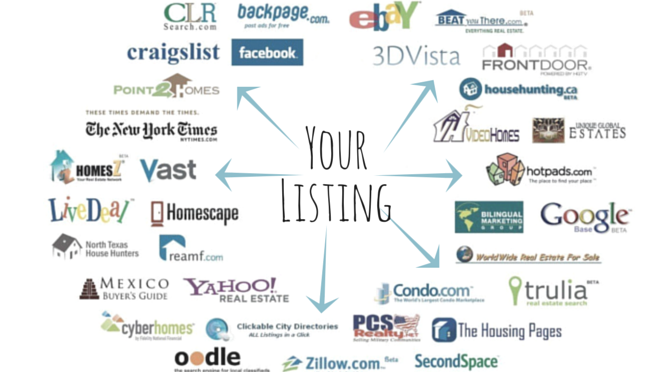 We market your home in every nook and cranny of the Internet. 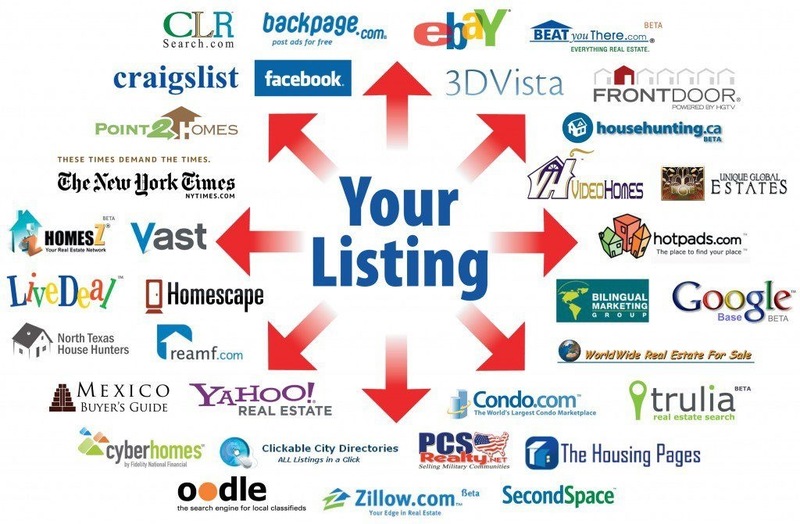 We list your home on sites such as Realtor.com, trulia.com, zillow.com, hotpads.com and a zillion other places. We distribute your listing on postlets.com that posts to 500 or so real estate websites in addition to our Realtor, MLS related web pages. The Internet is the main way most people ﬁnd real estate today using their computer, iPad or smartphone. 5. We post a video tour of your home on YouTube. Youtube is the second most used search engine on the Internet (Google is # 1). We make sure people will see your home in the front window of every street corner on the Internet. 6. We post your listing on Craigslist. This takes special effort and very few real estate brokerages post here. We always post here. We want EVERYONE to see your home is for sale. 7. We market your listing to experienced real estate professionals. These professionals sell 85% of homes in a normal market. The “MLS” (multiple listing service) is the only place to ﬁnd, in real time, properties that are currently available for sale. And, we use this tool to distribute your listing (a) among buyers’ agents with clients looking for your type of property in your area and (b) directly to buyers’ email inboxes who have indicated on the internet that they are looking in this particular area for this type property. If you haven’t loaded Realtor.com app on your phone, iPad and computer, then you need to stop and do that right now. This is your online tool into real time data that every Realtor accesses through the MLS. 8. A yard sign advertises your home’s custom website. People driving by do not have to get out of their cars to peak inside, see how big and how many rooms you have, check the sales price, and make a showing request. 9. We respond lightning-fast to all inquiries for information and showing appointments. TNT, explosive timing of “Today, Not Tomorrow” is one of our core principles. This is about integrity, and what we do when no one is looking. If your property can’t be shown, it can’t be sold. Too many home sellers and their agents drag their feet and do not respond to requests for information, and the hot lead cools off. We call, text or email back potential buyers or their agents immediately. We are legendary in our response time for listing information (everything else waits for us to ﬁnish responding to listing information requests). 10. We coach you on everything needed to sell for top dollar in the least amount of time. We sell the house with you– it is not possible for us to sell it for you. There are things you need to know and do, and we impart them: staging, de-cluttering, showing prep tricks, necessary maintenance and repairs that get bang for the buck, market and pricing research. Houses that are priced well (at the top end of the market) sell faster and for more money than houses that are overpriced and become shop-worn with too many days on the market. This entry was posted in best real estate agent in Central Florida, best real estate agent in Orlando, FL, best real estate agent in Sanford, FL, best Realtor in Central Florida, best Realtor in Orlando, FL, Sell Home Quickly, Sell My Home, Sell My House, Sellers and tagged asking price, Buy a home, buy a house, buying a home, home value, investments, market value, real estate, Realtor, Sell my home, selling a home, selling price, ways to sell your home. Bookmark the permalink.